My friend Dawn made this beautiful bishop for our princess. She is quite pleased as you can tell. It is made using the pattern for Beginnings from Australian Smocking and Embroidery Issue number #73. 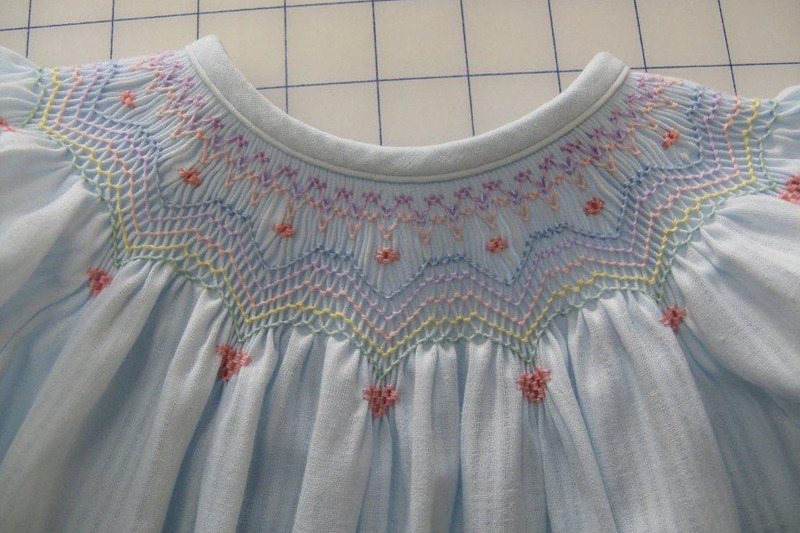 It is smocked with Rainbow Hearts by Ellen McCarn. Dawn removed a few rows to adapt for a baby size. 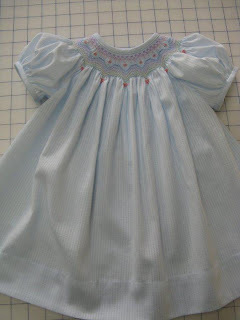 The fabric is Skip Dent from Spechler-Vogel in a pale blue. Both plate and fabric came from Bessie Mary. 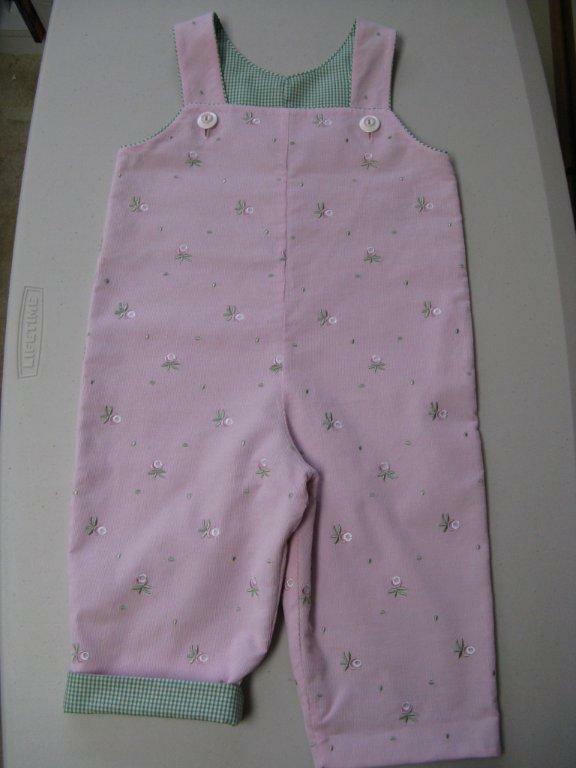 Also in the package, was this adorable pair of pink overalls. They are made using Children's Corner William and Winnie. The fabrics are an embroidered corduroy lined with a pima cotton gingham. Corduroy is the perfect choice since it is 10 degrees here today! She needed a shirt to go with them. Mommy has had a difficult time finding onesie type shirts that fit. So Mimi to the rescue. 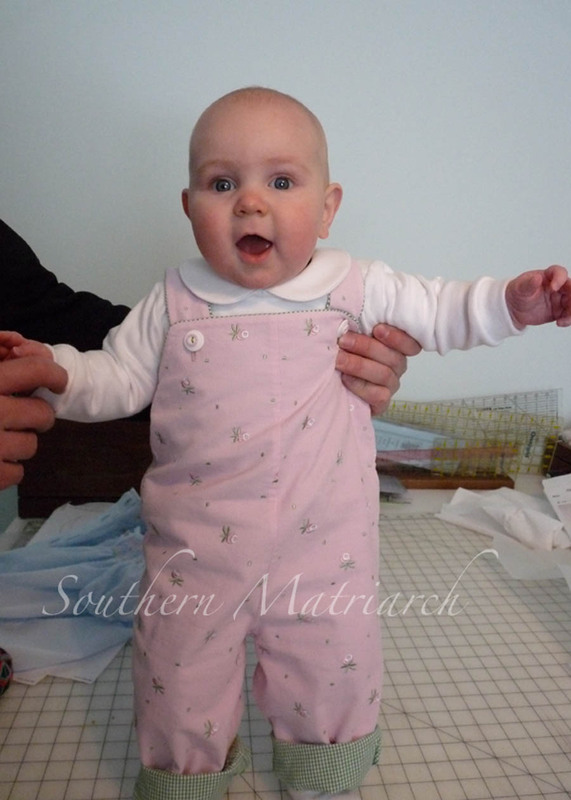 The shirt is made from cotton interlock. 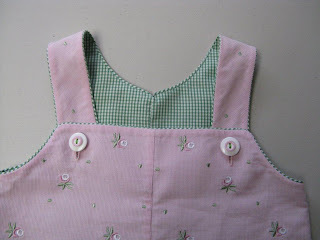 I used Kwik Sew #3375. 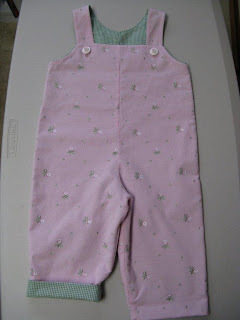 I added 2 inches to the body length to accomodate our tall girl and the cloth diaper. I also trimmed 1/8" off the collar so I could pipe the collar. 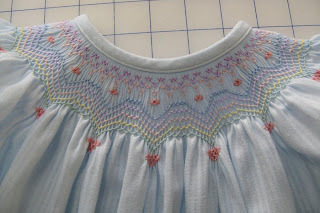 I used Gail Doane's block method of doing the collar even with a knit. Worked like a charm. Thank you, Dawn. She loves them as do her Mommy and Mimi. 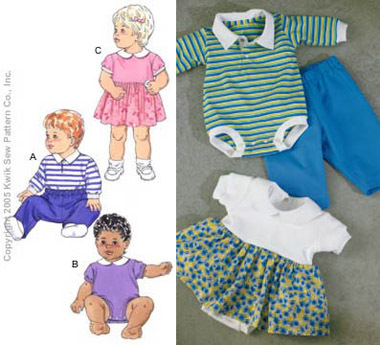 Real life "baby dolls" are so much fun to dress up! She looks happy about her new dress! Oh my goodness! These are just beautiful. And that little princess is a doll! how precious!!!! Dawn is a good friend. With three to sew for, I can't keep up anymore!!! She is getting prettier and prettier, and the outfits are adorable. I have an unrelated question. I noticed your pleating box in the background. I have one like that for my 24 row pleater, and want to get one for my 16 row pleater, but the lady I ordered from does not respond. Can you tell me where you got yours? I love the handle to carry, and that it's "dust" protected! 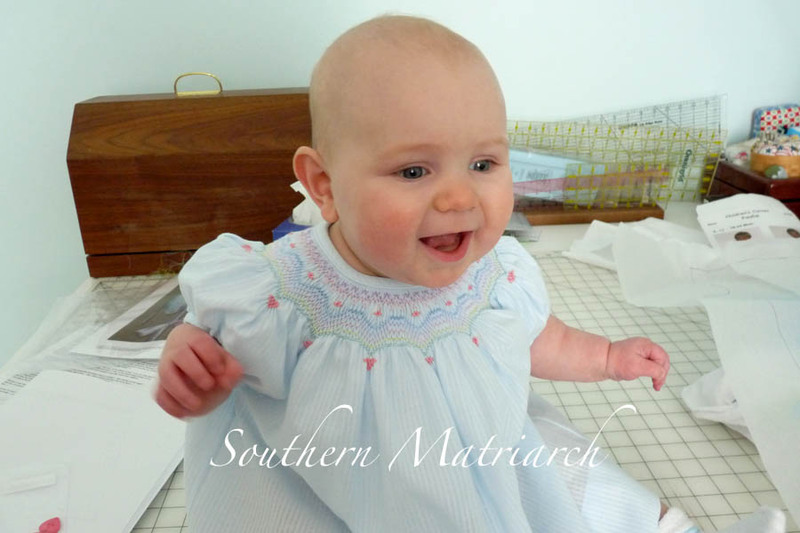 I love that she is sitting on your sewing table!! I agree w/ Jeannie! That's the first thought I had when reading this post. I love the green check w/ the pink. I would never have thought of that, being terribly color challenged. What a beautiful doll baby she is! Two gorgeous little outfits. Now that's some friend! Love that overalls, I had that fabric way back when but used it all. It's adorable! You are a great mimi. I forgot to comment on the bishop. It is beautiful, I love Dawn and her work. She's the best, her skills are wonderful. She's been good to me, sewing for my girls for Disney.